﻿ Fab Fantasy Fiction: FFF's Throwback Thursday: What book/author/series would you like to see digitized? FFF's Throwback Thursday: What book/author/series would you like to see digitized? For the New Year, I'm starting a new Thursday "tradition" on Fab Fantasy Fiction. Thanks to a suggestion from my good friend, Barbs, every week I'm going to "throw out" a book I'd love to see digitized - and why. If you could join in the conversation too - either here or on Facebook - that would be fabulous! So many publishing houses are now re-visiting their backlists and we've seen Harlequin digitize books as the Harlequin Treasury from the 1980s and 1990s, quite a few Barbara Cartland titles have been turned into eBooks as many of Grace Livingston Hill's. So, what title, author, and/or series would you love to add to your eReader? 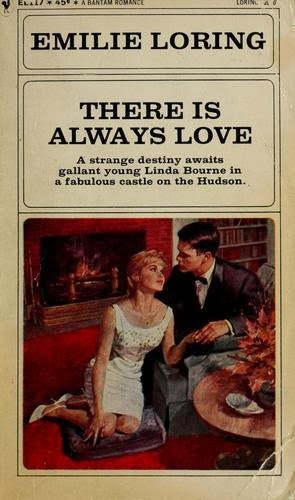 As I reflect back to the very first book that I read (and that I still own), which transferred juvenile affection for Nancy Drew and Trixie Belden mysteries into a slightly more adult novel, it is Emilie Loring's There is Always Love. I inherited this book from my much older step-sister, who had inherited it from her mother (it was the original Bantam paperback pictured here). Perhaps it was the fireplace on the cover that drew me in. The longing gaze between the two protagonists. Or perhaps the fact that the cover blurb said that the story was set in a fabulous castle on the Hudson (I grew up in a town on the banks of the Hudson). In any case, I began reading Emilie Loring's book and just could not put it down. My unending and devoted love affair with romance and romantic suspense novels began with There is Always Love. Every once in a while, I go to my bookshelf and pull it out to re-read. It's like comfort food. Reading the story of Linda Bourne and Greg Merton, the irascible and lovable dowager aunt, Linda's spoiled sister, the "castle" setting, the jewels... it's like I've curled up in a warm hug of comfort every time I turn the page. However, as this book ages out (and you have to admit these weren't printed on paper meant to last the ages), I become worried that I shouldn't be re-reading this copy any longer. I've waited and searched for Emilie Loring's books to be digitized and offered on Amazon.com to no avail. BUT there is a solution. Not perfect, but one that is workable. The fabulous project OpenLibrary.org has digitized many member library books and offers them FREE to borrowers around the world. All you have to do is sign up with your email address and you'll be able to borrow ebooks for up to two weeks to load onto your eReader. And yes, you've guessed it. OpenLibrary.org has several of Emilie Loring's books available for download as either a PDF or ePUB, including There is Always Love! So, until someone decides to digitize Mrs. Emilie Baker Loring's books there is a fix in place. Warning though, plan ahead as someone may have already checked out the book you're searching for and you'll need to wait until they return it to the library. So, what book(s) would you like to see digitized? Let's open the discussion up and hope some publishers take notice!